When his electricity was disconnected in late 2014, Rod lived with his wife and four of his seven children in Melbourne’s north. The disconnection lasted four days. Rod says the automatic payments he’d set up with Energy Australia had stopped going through, which he did not realise until the electricity went off. Rod called Energy Australia, who said he owed $600 and must agree to pay $250 per fortnight to be reconnected. He’d previously paid $100 per fortnight and could not afford the increase. Rod and his wife had a combined income of about $950 per fortnight, of which $800 went to rent and bills. Rod is 51 and suffers from Type 2 diabetes, heart problems, chronic fatigue and depression. He says the depression can make it hard for him to manage bills and correspondence. Rod has multiple qualifications but was unemployed at the time of the disconnection. His wife had irregular casual work. Energy Australia suggested he see a financial counsellor, but Rod didn’t feel that would help. During the disconnection Rod and his family stayed a few days with friends. They incurred extra costs including buying takeaway food and using payphones to call Energy Australia. On returning home they replaced spoilt food and bought a gas bottle for the BBQ, which they used for cooking. 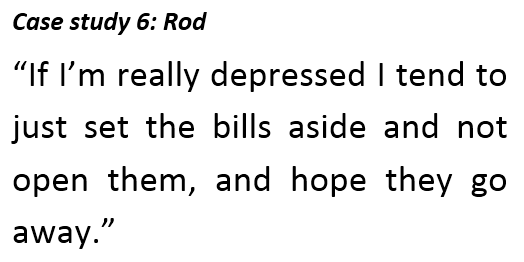 Rod applied for a bank loan but was refused. Eventually he borrowed money from friends and paid $400 to Energy Australia. His electricity was then reconnected. Rod then decided to switch to Origin Energy, who had been calling and doorknocking him for more than 18 months. After switching to Origin, Rod received calls from Energy Australia offering him new deals. He decided to go back to them. This caused problems: Rod says he notified Origin that he wished to cancel his contract within the cooling-off period, but then received a large bill from them. Rod is now in debt to both retailers. He says dealing with them has made his depression worse. Rod hopes energy retailers will try harder to understand how difficult things can be for low income households.